This is a partial list of fractional size violins for students. We frequently have quite a number of other instruments. These include new as well as used fractional violins that are fully set up here and are strung with D’Addario Pro-Arte strings. They are offered as outfits including bow and case. You are welcome to call us for more information on available instruments. We also carry a wide variety of accessories. All violins are set up in our shop. 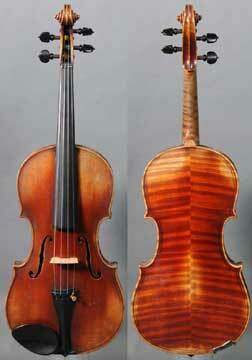 Here’s information on Violin Care. Call us at 608-255-2254 or E-mail us for more information. Here’s information about Ordering Instruments. The violins listed here are just a few highlighted instruments. Please check with us for additional instruments.